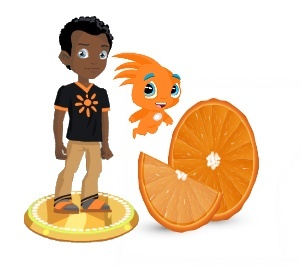 Lightgliders: Orange you Glad Party!! November 19th! Orange you Glad Party!! November 19th! Red Party Gliddle is stepping down for this event and we have a new Party Captain this week. Our special guest, Orange Gliddle, can't wait for this next party! The beginning of the week is great, but this is the "Orange You Glad It's Thursday Party!" It's time to get creative and look through your outfits to find clothes, hair, gliders and anything else with the color Orange! If you do your Gliddle Challenges this week, you will be rewarded with some perfect gear for the party. We will be meeting on Thursday, November 19th in the Courtyard at 7pm EST/6pm CST. Orange you excited!? We sure are! Invite your friends and we will meet you all on Thursday! Glide On! Wow! Cool new time! I'll be there! Orange you glad to hear that!